A plant release is a specific subset of plant material of a species that has been evaluated and tested. STN & cooperators make releases of selected plant materials following extensive evaluation and testing of accessions. There are several types of release that can be made, however, most of STN’s releases are Selected Germplasms. This type of release helps preserve the genetic integrity of the parent accession, and allows multiple accession releases. Documentation of each plant release is evaluated by the USDA-NRCS, CKWRI, and the TAR Plant Review Committee. Following release, seed is distributed to commercial growers for production of seed to be made available to consumers. Most STN releases are named using a place name that is unique to the set of plant material and south Texas. An example of this is “La Salle Germplasm Arizona cottontop”. La Salle was chosen because 3 of the 12 accession in this release originated from native populations in La Salle County, Texas. Releases help ensure that consumers and producers have plant material with known performance, origin, and expectations of quality. 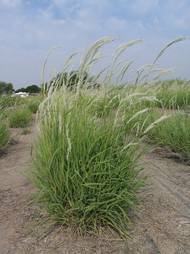 Seed of STN releases is typically sold as a Selected Texas Native Germplasm with a green seed tag.